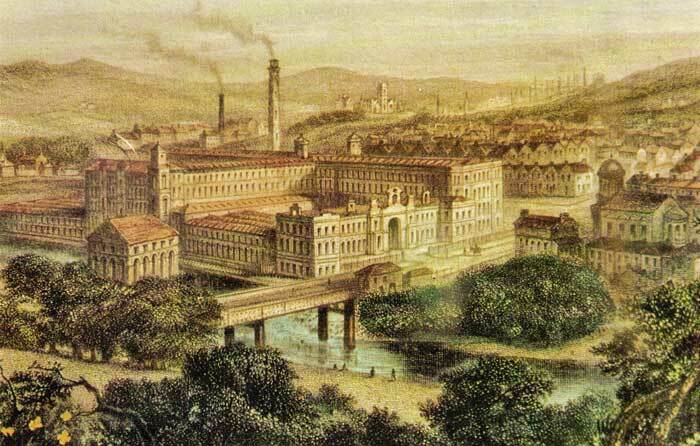 Saltaire was created by Sir Titus Salt in the 19th century for his workforce working in the nearby textile mills. 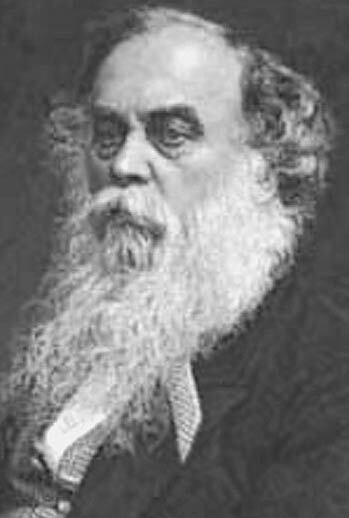 Titus Salt was born in September 1803. 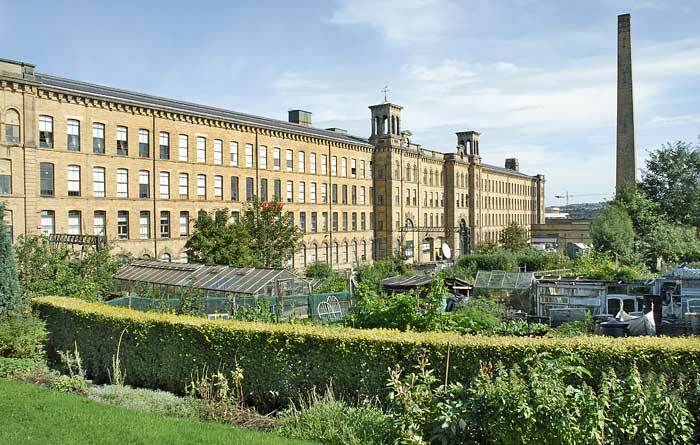 The family led by Daniel and Grace Salt already had a successful textile company and by 1833 Titus was running the family business "Daniel Salt and Son" in Bradford. During his term as Mayor of Bradford in 1848 he campaigned for improved conditions for mill workers trying to reduce the smoke and sulphur, but unfortunately received little support from other mill owners. 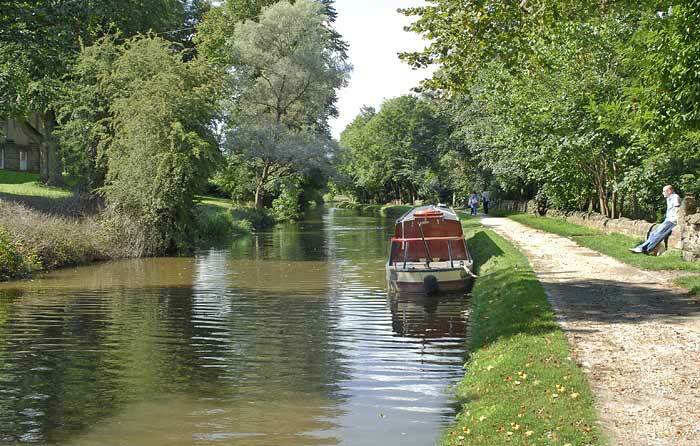 Two years later he decided to move out of Bradford and build a mill near to the River Aire and next to the Leeds and Liverpool Canal at a site he named Saltaire. The mill open on Salt's 50th birthday in September 1853 and included a banquet for his 3000 workers. Using alpaca wool he found the wool could be transformed into the finest cloth if woven on a cotton or silk warp. The 1200 looms produced 18 miles of cloth a day, and was the foundation of his immense wealth. 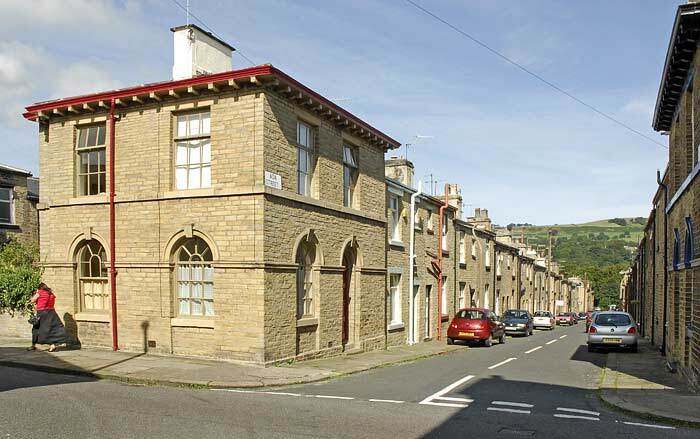 Over the next 20 years Titus Salt created more than 800 houses for his workers and their families as well as shops, schools, health provision, clean water, bath houses and a hospital. 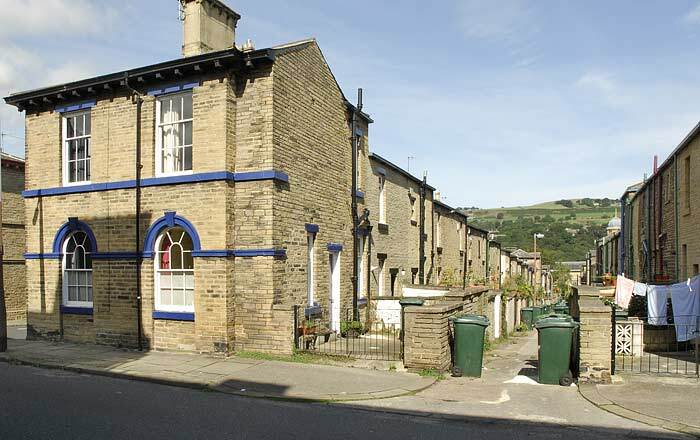 Gas was supplied for lighting and heating, he even built washing and drying rooms for the families as he disliked washing hanging from lines behind the houses. Sir Titus Salt died in December 1876, most of his vast fortune having been spent. At his funeral it's said that 120,000 people lined the streets to pay their last respects to the textile magnate. 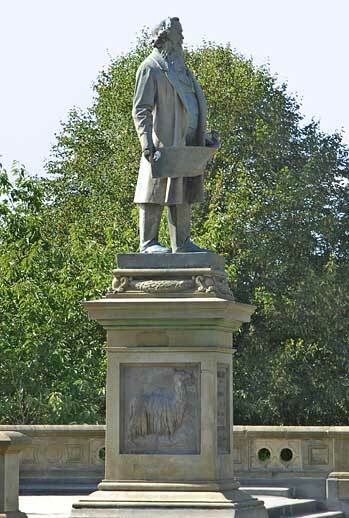 Sir Titus Salt's statue in Robert's Park, on the northern bank of the River Aire. Some of the 800 houses he built for his workers. Below the back lane and gardens with washing drying on a line, something you wouldn't have seen in Salts time, plus a 20th century eye sore the wheelie bin. 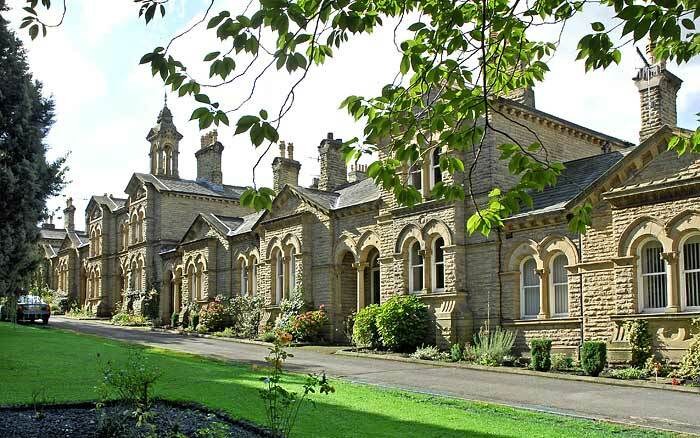 The alms houses Salt built opposite his hospital, the hospital is now converted into flats and offices. 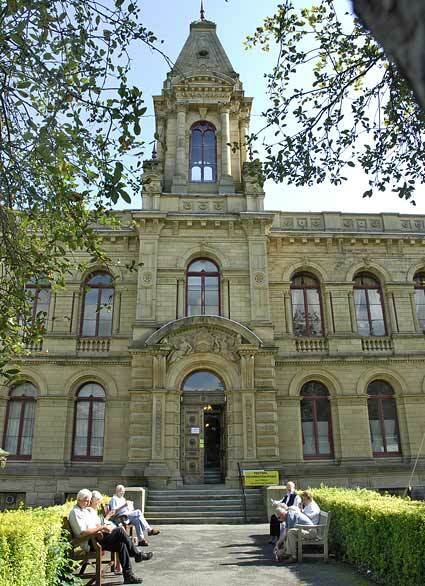 The Victoria Hall, again built by Titus Salt was equipped with reading rooms, a library, a lecture theatre to accommodate 800 people with a 35 ft. wide stage, a school of art, a billiard room. 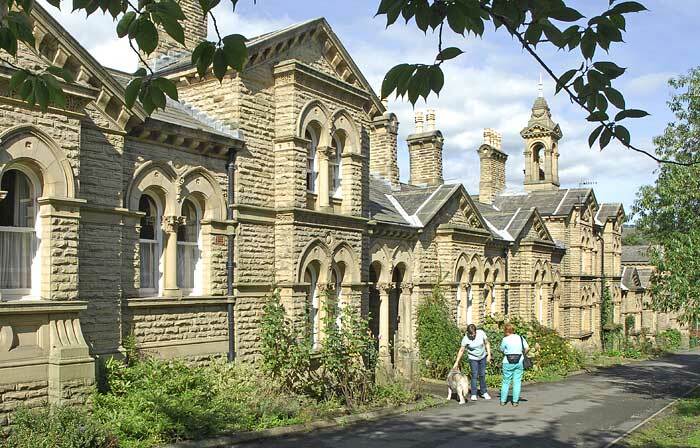 Whilst in the cellar, was another lecture room, a gymnasium and various classrooms, today the building houses a library and the Harmonium and Reed Museum.